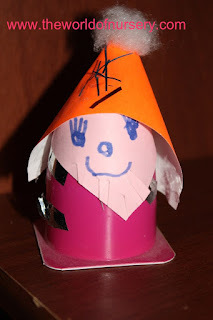 One year ago I decided to create the Gallery of Imaginative Play and Games. There are 186 projects in the Gallery now. The main aim of the Gallery is to create the platform where the kindergarten teachers, school teachers, psychologists, parents can share the ideas of the development of the imagination of children, where they can help each other and support each other in this question. 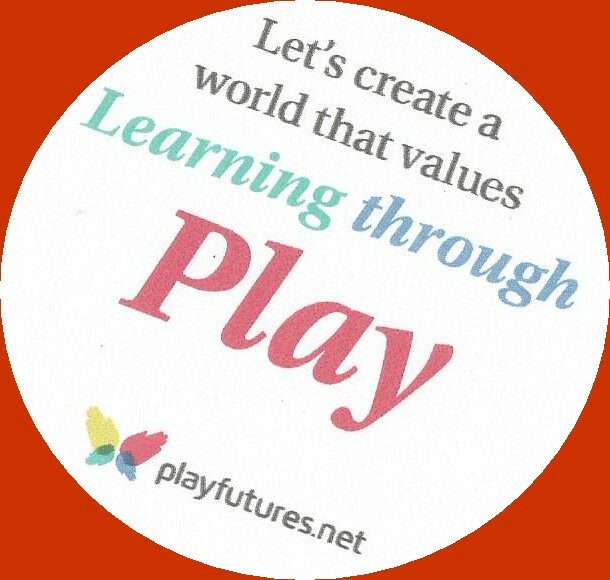 Let me introduce the Fourth Review of the Gallery of Imaginative Play and Games (the first three reviews are here). Photo from the blog "Babochki"
the simple bottle caps were also used by Natalia to create the mathematical game (152): on the bottle caps of white color the children found the mathematical tasks like 6+0, 2+2, etc. ; on the yellow bottle caps there were the results. Children had to find the right results. Mathematics is often difficult for children, but such types of games help to make this science funny and favourite for children. The nephews of Natalia also took part in the creation of the Gallery: they wrote fairy tales, small magazines, painted the illustrations for them (156). Olga Astrakhantseva, Ust-Kamenogorsk, Kazakhstan ("Magiya Biologii") is an active participant of the Gallery of Imaginative Play and Games. 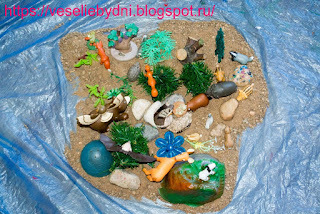 Photo from the blog "Magiya Biologii"
under the link 181 in the Gallery of Imaginative Play and Games the readers will learn how to make an interesting toy for children - a water insect. 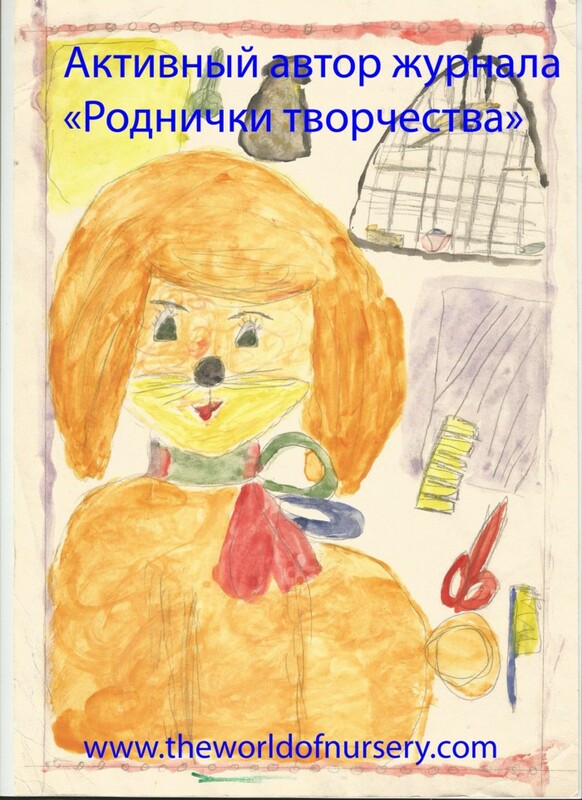 On the blog by Astrakhantseva Olga fascinating meetings of the heroes of the puppet theatre are also continuing to exist: projects 151, 164, 167, 174, 183, 186. Permanent heroes: the monkey, the elephant and others and new heroes answer the most unexpected questions of children: "How the sunflower tracks the sun?" (151), "Why on trees at first there are flowers, and then the leaves?" (164) "Do the spiders bite?" (167), "Why the moth is necessary?" (174). This puppet theatre helps parents to understand how to satisfy children's inquisitiveness in a playful way. Also the heroes of the puppet theatre told the readers why leaves become yellow and red every year (183, 186). It would be desirable to pay special attention to the articles which will be interesting both to children, and adults: it is a post about a butterfly under the name a red shashechnitsa of a didim (158), an adventure of a ground squirrel (160), the story about fruits (161), advices how to collect an ecological collection of butterflies (165), story about a mantis (170), the story about a structure and functions of stamens of a flower (178). 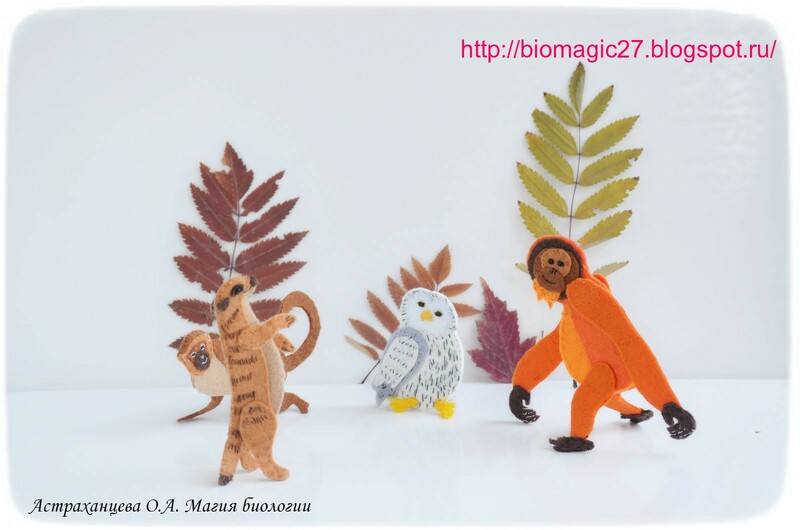 Articles contain master classes, poems, experiments which help to make biology interesting science. Besides, the fairies, who often act as Olga's assistants, make the biology charming and magical. Elena Ishimova (Chelyabinsk, Russia, the blog "Smeshariki) told us about a remarkable game with magic beings - 'Gonziki' (150). 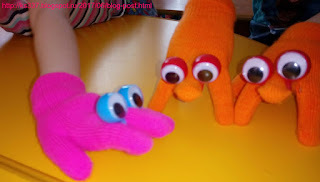 Photo from the blog "Smeshariki"
It is easy to make these toys - you need only gloves and eyes, but there are so many variants of games with them. You only need the imagination! Anna (Minsk, Belarus, the blog "Veselie budni") told us how her children learned about France by the means of pictures, toys, games, etc. All readers had an impression that they visited this country with children (154). Photo from the blog "Veselie Budni"
Thanks to Anna and children, readers of her blog could get acquainted with the prehistoric world: the real exhibition of the toy dinosaurs was organized (159). The children organized the adventures of knights, having prepared all necessary things and decorations(162), and they also organized the contest of grannies (171). These entertainments help children to learn about different countries, about history, to invent something. The last entertainment - a good method to have a certain emotional discharge. Also Anna shared 21 possible entertainments on the beach which will be useful next summer (168) and told how to organize a great Birthday for the teenager which will be interesting to children and adults (169 - the Birthday in style of "Psychic Challenge"). Photo from the blog "Cvetik-Semicvetik"
on the second blog (177) Oksana Vladimirovna shared how to make the following books: "Work of the Miner", "Wonderful Transformation of Butterflies", "Alphabet of Color". The children from the kindergarten group also made the butterflies by the different techniques: 175, 176. When children do something, they will remember the studied material better. Besides, at the beginning of an academic year children made the real seabed of CD-disks by the means of plasticine: 184. Now children understand that simple disks are also good materials for the creative work. 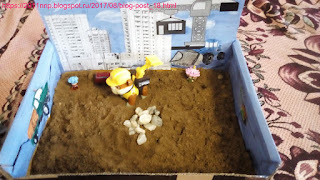 Natalia Perepelko (Chelyabinsk, Russia, the blog "Detki-Konfetki") told us how kindergarten teachers and parents made the toy highway in the kindergarten (157), built the sports equipment (163) and made the real building site in house conditions (179). The children's gaming equipment, toys made with own hands comprise a set of options for different games. Not only adults can offer the plots of possible leisure, but also children will begin to complete something, to dream, to invent and to remake. Photo from the blog "Detki-Konfetki"
Natalya also offered a master class - decoupage (166) which will be interesting to readers of any age. This technique can be done together with the child, and then, it is quite possible that the child will decide to paint something special and new. 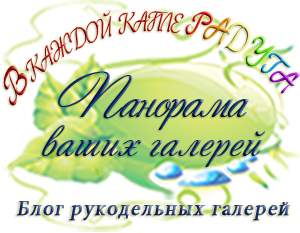 Victoria Sviridova (Krasnodar, Russia, the blog "Advokat" Dertskoy Dushi") joined us with the wonderful animated films of animation studio "Karusel": 172, 173. 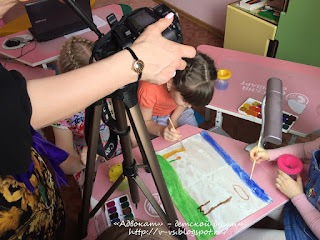 Photo from the blog "Advokat" Dertskoy Dushi"
Children are active participants in the creation of animated films. They learn to interact with each other, they learn something new. I assume that children will begin to invent the plots and the heroes. The lessons in such studios - an incentive for the further development of imagination and creative abilities of children. 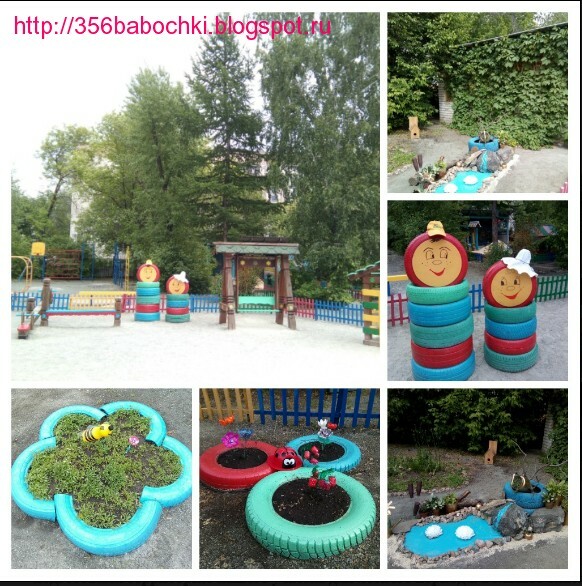 Please, visit the blog of Victoria Aleksandrovna and look at the creations of children. Julia Zueva (Chelyabinsk, Russia, page of the psychologist Yulia Zueva) is the new participant of the Gallery of Imaginative Play and Games (project 180). She wrote the blog post devoted to the "Lodges where Smells Live". It is a very interesting fragment of activities of Julia with children. Among specially made lodges children look for the smells which are associated with their names: apple, cherry, a lily of the valley, etc. Your name is a part of you and is connected to such pleasant associations. 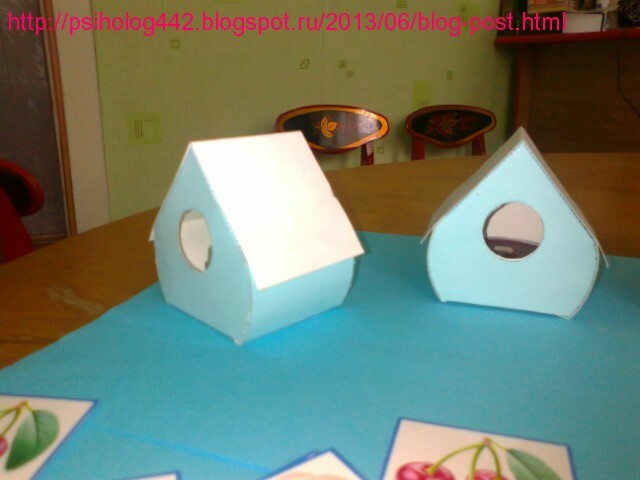 Nadezda (Podolsk, the Moscow region, the blog "Vidymshiza") wrote about summer lessons with her daughter Ksyusha (182). Appliques, games, the real city from toys, etc. - it is so cheerful and with a favor Ksyusha spent a part of the summer days. Especially it is worth emphasizing the city from toys in which there were a school, hospital, cafe, such games - a good method not only to develop the imagination of the child, but also an opportunity to talk with the child when he or she is responsible for the personages, answers their questions. Photo from the blog "Vidumshiza"
Vova Matveev from St. Petersburg (185) is also continuing to participate the in the Gallery and decided to share hand-made crafts which he made in the kindergarten. 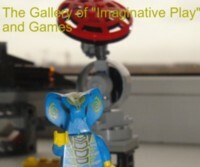 The Gallery of the Imaginative Play and Games (the Gallery is here) continues to exist. Join us! I want to remind that all projects automatically become participants of the competition! Everybody will receive souvenirs and certificates of participants! We wait for the new projects! The next blog post will be devoted to the competition! Stay with us!